in a small home or in a apartment . Although you cannot have the lavishness of a full-fledged kitchen garden, you can grow many things (in smaller amounts) in your little space. Your options are: fruiting vegetables like tomatoes, brinjals, capsicums, radish and spring onions; salad greens like lettuce and cucumber; and indispensable herbs like mint, coriander, garlic, ginger, curry leaf, oregano, thyme, green chilies, etc. However, you might have to buy your daily quota of root vegetables like potatoes and onions because they need more space to survive. Two factors will help you decide on the right containers: available space and the plant you choose. For example, herbs will need pots that are between 6 to 10 inches in size. Tomatoes and brinjals will need larger pots (of at least 20 liters capacity). Capsicums and cucumbers require 4 to 8 liter pot per plant. Opt for window boxes if you have a flat with many windows. They are convenient and look fairly attractive. Terra cotta and stone pots, unlike plastic ones, allow plants to breathe freely but they dry fast and are difficult to shift. Wood containers save plants from excessive heat but plants tend to rot. Place plastic saucers under the pots to avoid soil and water spillage. Get creative. Don't throw away buckets, wire baskets, etc. Use them along with hanging baskets for smaller plants. Say no to containers with small openings. Make drain holes in all the pots. The planting media should be disease-free, lightweight and capable to hold moisture. It should be drainage-friendly and contain vital nutrients. Organic manure or compost can be a wonderful growing medium. You can add decomposable kitchen waste to it. Besides this, you can buy commercial or synthetic potting mixes made from sawdust, peat moss, vermiculite and wood chips. You might have to add a little lime to neutralize their acidic contents. A combination of loamy garden soil, sand and peat moss also makes a good growing mixture. Transplanting is ideal for container gardening. You can get various seedlings from the nursery. Plant them carefully so you don't harm their tender roots. There are many chemical fertilizers in the market. But liquid organic fertilizers will be much better for your greens as these are your edible plants. Transplants would need nutrient solutions from the moment you plant them. In case of seeds, the solution dose is required when plants germinate. When you buy seeds or transplants, remember to enquire about the frequency of fertilization and the duration of sunlight each plant should receive. All vegetable plants need constant moisture. Some plants might need water on a daily basis. Avoid wetting the foliage because wet leaves might invite diseases. Companion gardening is highly recommended to keep insects away. For example, garlic plant protects cucumber and celery plants and these pots can be placed close together. However, if insects or diseases do strike your plants, go for the safest botanical or microbial pesticides. 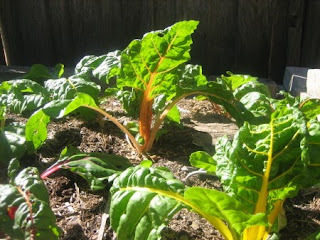 When ripe vegetables start peeping from green plants, it will be a moment of pure joy. After all, how often do you see hard work paying off in just a couple of months?